After all the drama of its launch, the return of the latest Dragon spacecraft was, fortunately, a bit anticlimactic. The International Space Station’s robotic arm unberthed Dragon from the station, releasing it at 6:56 am EDT (1056 GMT). Dragon pulled away from the station and reentered a few hours later, splashing down in the Pacific Ocean a few hundred kilometers off the Baja California coast at 12:36 pm EDT (1636 GMT). 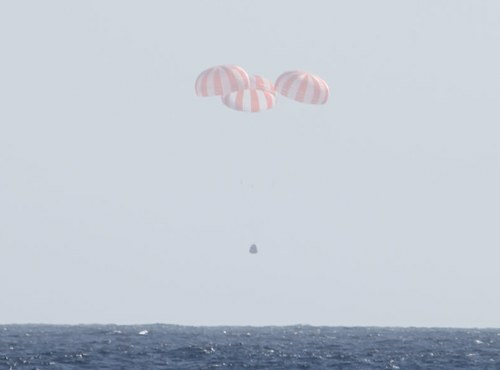 All phases of Dragon’s return to Earth went well, according to SpaceX, and the capsule on a ship headed back to Los Angeles. With that mission wrapped up, though, the focus of SpaceX shifts a bit. Until now, every Falcon 9 launch, dating back to the vehicle’s introduction in June 2010, carried a Dragon spacecraft of some kind (that inaugural launch carried a boilerplate model, while subsequent missions carried “real” capsules.) Now, however, SpaceX will be demonstrating over the next several months the ability of the Falcon 9 to carry more conventional satellite payloads using a new version of that rocket. The company’s next launch, now planned for some time in June, will feature several firsts. The launch will be the first of the upgraded “v1.1″ Falcon 9. That version uses Merlin 1D engines that generate more thrust than the 1C versions uses on previous Falcon 9 vehicles. The company announced last week that the Merlin 1D was flight qualified after completing an extensive series of tests. The first stage of the Falcon 9 v1.1 is also longer to accommodate larger propellant tanks, and the nine Merlin engines are arranged in an “octagonal” (eight in a circle with the ninth in the center), rather than the three-by-three grid of the original Falcon 9. The launch will also be the first to take place from the company’s new launch facility at Vandenberg Air Force Base in California, on a pad previously used for Titan IV launches. The launch will also be the first to carry a satellite, and thus require the use of a payload fairing. The payload will be CASSIOPE, a Canadian satellite carrying a space weather instrument as well as a broadband communications technology demonstration payload. Assuming that launch is successful, SpaceX plans to rapidly follow that mission with two commercial satellite launches. Speaking at the Satellite 2013 conference last week, Barry Matsumori, senior vice president for commercial sales and business development at SpaceX, siad the company plans to launch its first geosynchronous orbit (GEO) satellite, SES-8 for European satellite operator SES, in early July from Cape Canaveral. That would be followed in late July by another commercial GEO satellite, Thaicom 6. That rapid pace of mission raised more than a few eyebrows at the conference, but Matsumori confirmed they can turn the pad around at the Cape in less than three weeks if required. Two more Falcon 9 launches are planned by SpaceX before the end of the year, Matsumori said. One will be the first group of ORBCOMM satellites, while the other will be the third Commercial Resupply Services (CRS) Dragon mission to the ISS. Now we are going to see if SpaceX can do the business part as well as they’ve learned to do the engineering part. As a child of the sixties I do wonder…. can spaceflight ever truly become routine? Good luck to SpaceX, make it pay! I am very confident that SpaceX will succeed in making spaceflight significantly more routine than it has been. I think space flight will become “routine” when we find a way of getting us into space slowly via laser or EM beam energy. The technology has been shown to work with low weight objects. If we could get into say a 100kgs pod and be ferried up by laser or beam to LEO where we would dock with a spacecraft, that would change the whole nature of spaceflight. No need to suffer huge G forces. Maybe an hour or two to LEO. Clearly though, that is a few decades away. Laser and EM beam energy technology has been shown to work with low weight objects? I’m a newbie and don’t know much. If you could explain a bit more. What low weight are we talking about? Is there really a possibility for people to be “beamed” in let’s say 40 years? That’s so exciting. Thanks.